This is the long awaited Misfit Bloom necklace review I promised you guys some time ago. My girlfriend has been wearing the Misfit Bloom now for over 4 months and she still likes the necklace very much. Compared to any other fitness tracking device the Misfit Bloom is real unique. Turn the Shine into a piece of jewelry with the Bloom to wear it at any time or occasion. It integrates seamlessly into your wardrobe and is just a feast for the eyes. 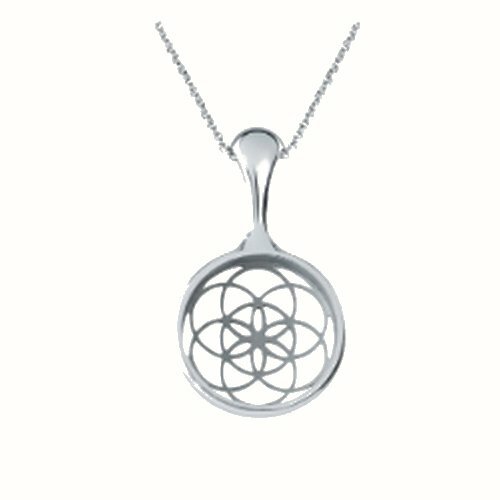 The necklace is made out of hand-finished stainless steel and has a very elegant and modern style. Because the Bloom itself has a decent neutral color it can be equipped with any colored Misfit Shine and is ideal as a present for every user of a Misfit Shine. Attaching and using the Misfit Bloom is easy: Just snap in the Shine, switch the wearing position of the Shine on your app and you are ready to track your fitness. As soon as the Shine is attached you can tap it whenever you would like to see your daily fitness progress. Through its magnetic design the Misfit Shine is held securely inside the necklace. If you like to, you can remove the chain and exchange it with any other you prefer. If you have not heard of the Shine yet, it is a waterproof fitness tracker and pedometer made out of high quality aircraft-grade Aluminum. It has integrated a 3 axis acceleration sensor and wireless Bluetooth 4.0 connection. You can easily sync the Shine with your smartphone and track your activities and steps throughout the whole day. Please note that the Shine is usually not included when you order the Misfit Bloom! The Misfit Bloom is one of the nicest jewelry accessories for fitness trackers available on the market. It is designed for people who prefer to wear their Misfit Shine activity tracker around their neck. Find more Misfit accessories here. Although some people have been reporting that their Shine is falling off, my girlfriend did not experience that problem. Probably for very intense activities the Misfit’s clip holder will be suited better. Moreover I would not recommend to use the Misfit Bloom during your sleep because the Shine might fall off and the tracking results will not be too accurate. If you would like to go swimming I recommend you to use the Speedo Shine which is especially designed for that activity. The official price for the Misfit Bloom is at $79.99 and because of that it’s a rather expensive accessory. Elegant and modern looking fitness tracker necklace for your Misfit Shine. Looks good on everyday use and even when you wear a ball dress. The Shine is easy to attach and is being held securely.